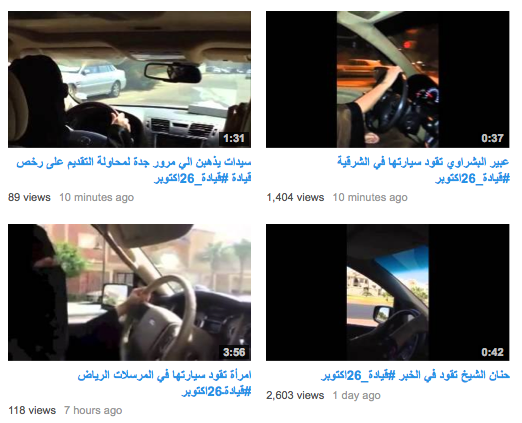 Since October 26th has been chosen as a day for defying the government ban on women driving, Saudi women have uploaded videos of themselves preparing for the day. Opponents, on the other hand, sought government harsh enforcement of the ban calling it a “conspiracy” and describing it as a “demonstration” in a country were demonstrations are strictly prohibited. The campaign's YouTube channel and Instagram profile were filled with videos and photographs of women driving in major roads, and others that are getting trained for driving. هل يعلم المطالبون بقيادة المرأة أنهم يخدمون أعداء هذه البلاد بإدخالها في الفوضى ونشر الفساد، وهي أحوج ما تكون للأمن والإيمان والاستقرار! Do those who call for women driving understand that they are serving the enemies of this country by getting it into chaos and corruption when it badly needs security, faith and stability?! al-Omar, and other clerics, tried to visit the Royal Court yesterday, October 22, but they were not given an appointment. In a video recorded outside the royal court [ar], al-Omar said that those who call for women driving “are not taking the legitimate method” (referring to defying the ban, rather than asking the king to repeal it). Regarding what has been circulating in social media networks and other media channels about forbidden gatherings and demonstrations for women driving, the regulations in the kingdom prohibit whatever violates civil security and calls for temptations of harm-seekers and those with sick dreams. For that reason, the Interior Ministry assures everyone that the specialized authorities will enforce the regulations on those who violate them with firmness and vigor. للأشخاص الذين يروجون بأن هناك مظاهرة يوم 26 اكتوبر ، نحيطكم علما بأننا لا نكل ولا نمل من تكرار بأنه لا يوجد مظاهرات ولن تهبط عزيمتنا بتاتا. For those who promote that we are calling for a demonstration on October 26, we want to inform you that we had tirelessly repeated that there will be no demonstration, and this will not weaken our will. The statement of the Interior Ministry regarding women driving is similar to el-Sisi's that gave a chance for all parties. Each party interpreted the statement as being in their favor.